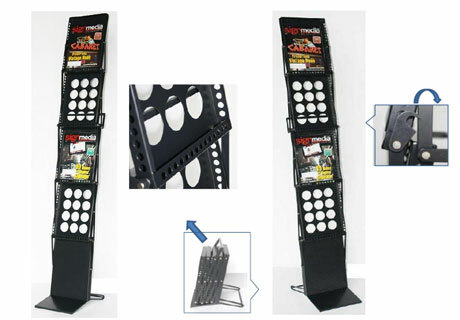 Six (6) collapsible magazine racks. Brochures or catalogues can be displayed on either side of the racks. Made of aluminium and easy to setup: remove from bag and lift the top. Perfect for exhibitions, sales promotions and marketing campaigns. 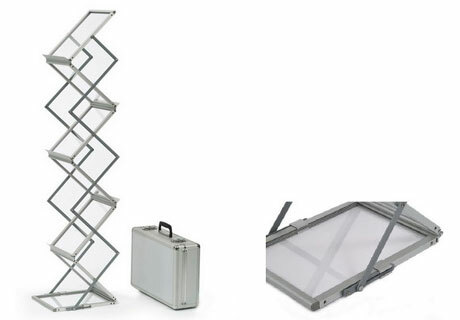 This fast-fold design steel folding brochure holder has 4 pockets that all face one side. Each of the four pockets measures 9" w x 12" h x 1" d, which is great for standard 8.5"w x 11"h literature or two tri-fold brochures. 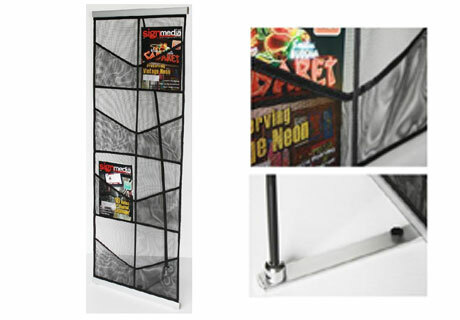 Very light weight yet stable and easy to use roll-away mesh fabric literature rack. Perfect for anyone who needs a lightweight and portable literature stand. Made of aluminum frames, black mesh fabric, and has 8 single-sided pockets.